Heads Up! An Exciting New Discovery! Easter Island heads have great bodies! 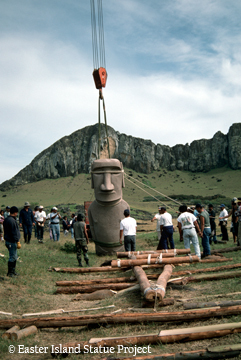 Welcome to the Easter Island Statue Project (EISP) web site! This letter brings New Year greetings for a happy and productive 2019! Thanks to everyone for their support and interest in our research, and especially to our colleagues who have shared so much information now being shaped for inclusion in our major writing project, the “Easter Island Atlas” due to be completed (fingers crossed!) by the end of this year. The past year ended with the great event of the Early Pacific Migration and Navigation Conference. 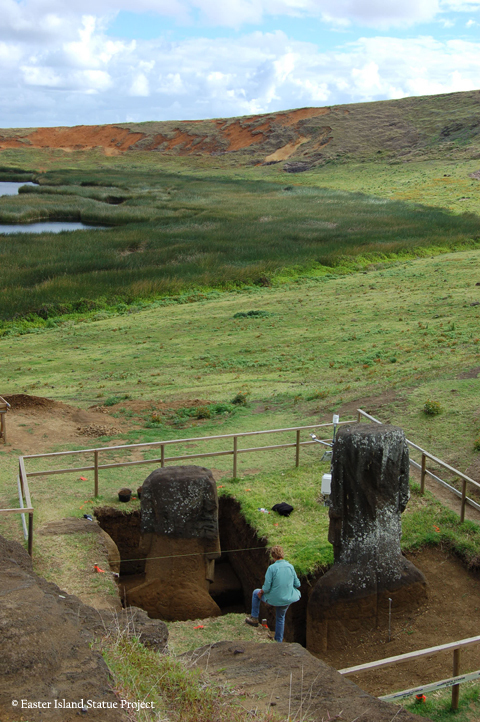 Held at Hanga Roa, Rapa Nui and organized by archaeologist Sonia Haoa and her Mata Ki Te Rangi Rapa Nui Foundation team, the conference offered a wonderful series of interesting papers and great social events. EISP sponsored the attendance of four members of our team, and we delivered four interrelated papers. We were joined by good friends and supporters from UCLA, and we all reveled in the warm hospitality of the Rapanui community. At the Mana Gallery we launched Mana Press with a great party for the attendees! Our new series of “small books” is edited with Adrienne L. Kaepper. The first is entitled “The Iconic Tattooed Man of Easter Island.” The second will be out later this year and will focus on Rapanui music. We also presented the Spanish translation of my “Among Stone Giants” by José Miguel Ramírez and published by Rapa Nui Press. I am very pleased and proud to say that, during the opening reception, I was one of three recipients of an award presented by Sonia Haoa and given for “humanitarian values” and respect shown the “traditions and values of the past” through archaeological research. All in all, a wonderful year. Charles Stanish, Jo Anne Van Tilburg, and Charlie Steinmetz at the opening reception for the Early Pacific Migration and Navigation Conference, Rapa Nui, November 2018. Sarah Sherwood presenting at the Early Pacific Migration and Navigation Conference, Rapa Nui, November 2018. Mana Gallery opening for the launch of Mana Press, November 2018. Our attention is still fixed firmly on the preparation of our Atlas manuscript. We have engaged with colleagues, exchanged data with collaborators, and traced down myriads of new ideas, all of which were stimulating and enlightening scholarly adventures. In May we traveled to Rapa Nui with Jeff Brown and the amazing crew of the PBS NewsHour “Cultures At Risk”! We met new friends in the Rapanui community who are devoted to conservation in the face of new climate change threats. Basic Geology of Rano Raraku, Easter Island (with focus on groundwater), Richard K. Dunn, Ph.D.
Dunn pointed out that Rano Raraku stone (tuff) contains abundant fractures that act as conduits for groundwater. Precipitation enters these fractures and groundwater flow delivers water to the lake. It sits 30-40 m above the surrounding land surface and approximately 65 m above the regional groundwater table. The lake level has fluctuated in the past, and Juan Tepano told Katherine Routledge that, when he was a young boy, the lake was just a marsh. In general, seepage out of the lake has balanced the in-flow of precipitation-derived water. In July 2017, the lake level appeared to be normal (Figure 1), but by September there was a noticeable decrease. On January 25, 2018 the surface of the water displayed an unusual pattern (Figure 2). The reason for the rapid reduction in lake level that subsequently took place (Figure 3) is unknown, but one possibility is increased lake drainage through bedrock fractures. By our May visit the water level was up again. Chilean scientific consultants opined that the cause of the original water loss was low precipitation and evaporation (Figure 4). According to Dunn, a possible aggravating cause is regional seismic activity. We are all aware of the restless volcanic activity of Mauna Kea in Hawai’i. It is also noteworthy that seismic activity is recorded on the East Pacific Rise, 350 km west of Rano Raraku, as recently as February 27, 2018 (Mag 4.7, 10 km depth; USGS). The result of this situation for Rapa Nui is a renewed awareness of the potential threats of climate change. 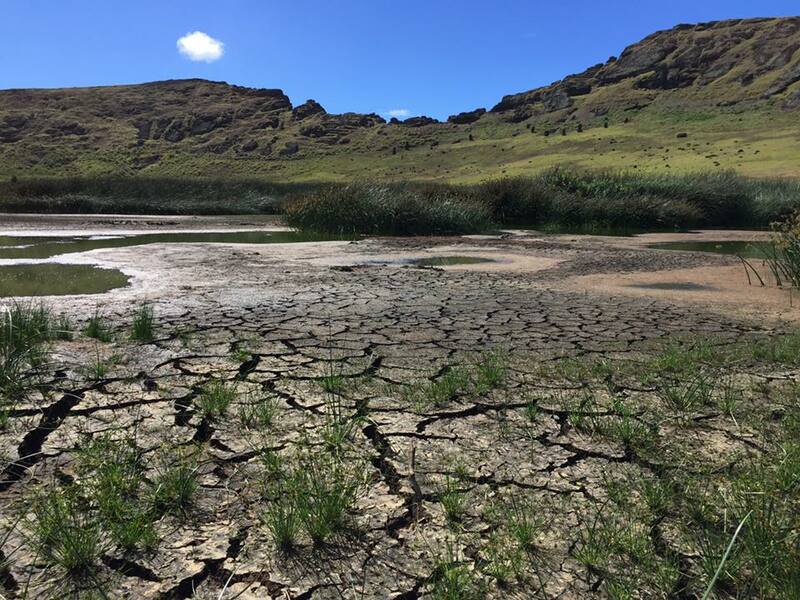 In November an international scientific conference will discuss the pressing issues facing the island today, one of which may be variable rainfall and drought. Figure 1. 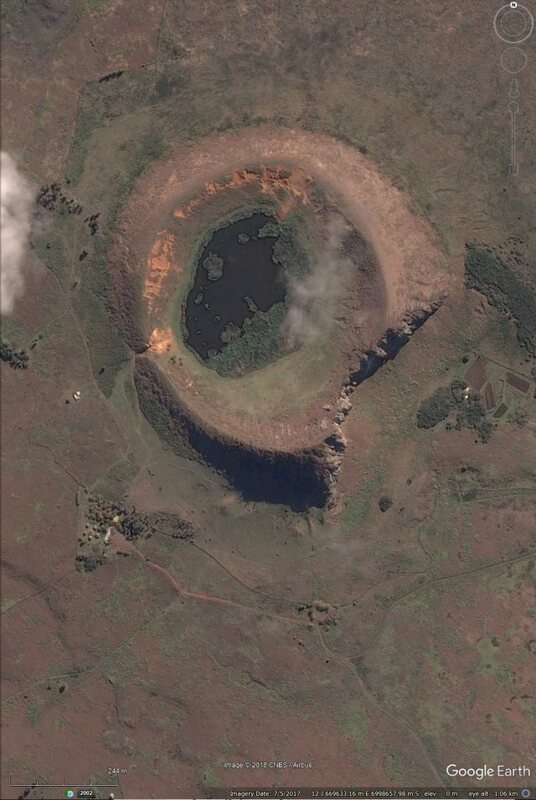 Rano Raraku crater lake, satellite imagery dated July 5, 2017, via Google Earth. Figure 2. Rano Raraku lake in January 2018. Photo by Carlos Antonio Serey. Figure 3. 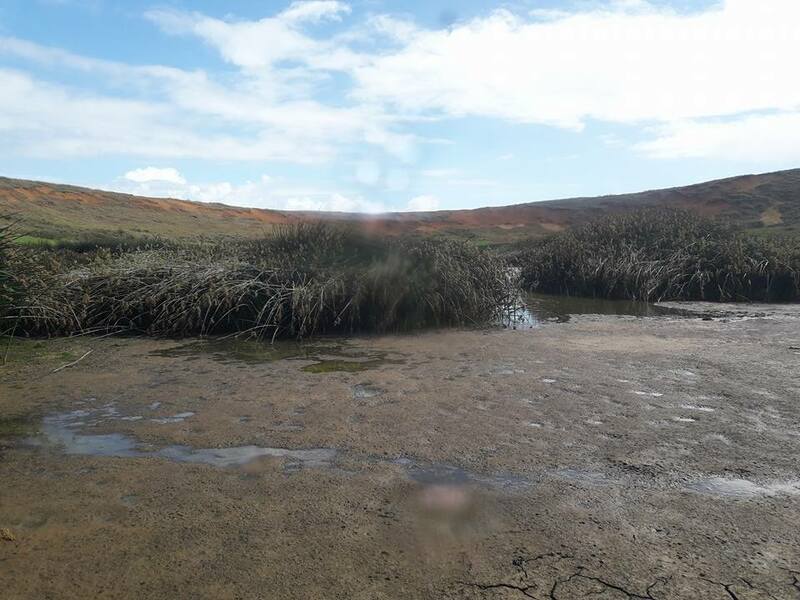 Rano Raraku lake in March 2018. Photo by Nico Yancovic Pakarati. Figure 4. Rano Raraku lake as seen during filming of PBS NewsHour, May 2018. Still from video by Malcom Brown, PBS NewsHour. 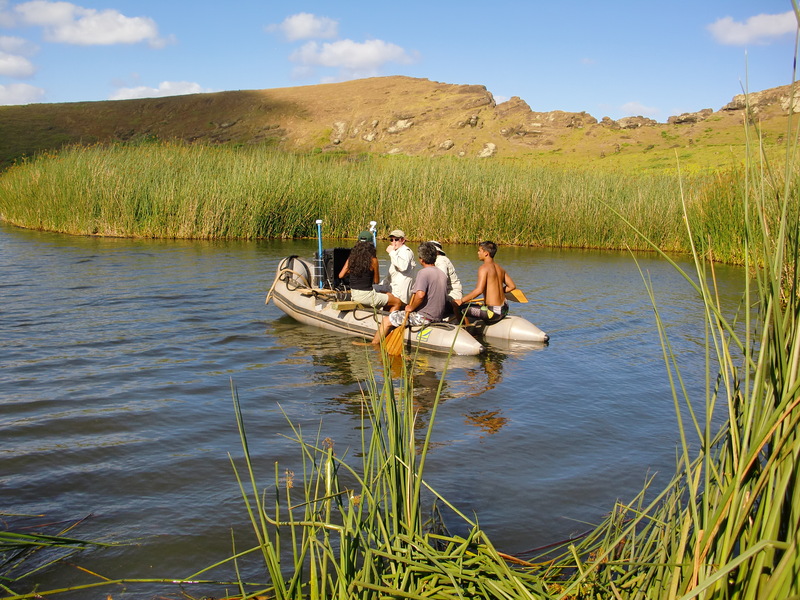 Jeff Morris and Rapanui crew on Rano Raraku Lake in 2012. This letter brings you special greetings for the coming year from all of us at EISP. Since our last Letter from the Director we have been on hiatus from excavation and hard at work doing all of the other important tasks you so rarely hear about but which are essential to good research: lab work, radiocarbon analyses, museum studies, and writing reports! This has been an intense period of cooperative research with gifted colleagues, and we are grateful for their involvement. 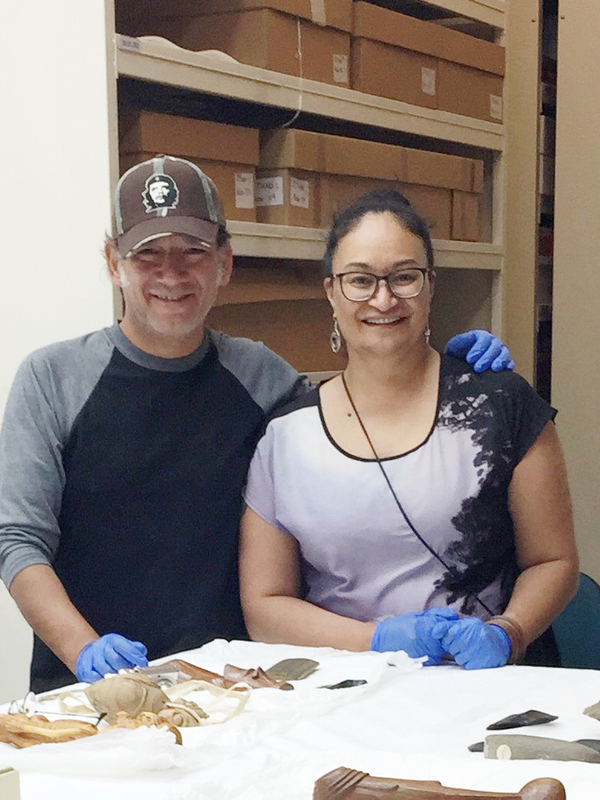 Beginning in early 2015 José Miguel Ramírez, co-investigator of EISP, arranged for Chilean scholar Pauline Peralta to examine our obsidian collections. Through Joan Wozniak we met Jon Krier, who studied our basalt collections. My UCLA colleague Tom Wake reviewed our bone collections. Cristián Arévalo Pakarati accomplished detail drawings of important artifacts, and then he and I traveled to Tahiti, Australia, and New Zealand to examine objects of comparative research interest. I reviewed Bishop Museum collections in Honolulu. Radiocarbon determinations on our charcoal samples were accomplished. Other botanical analyses were carried out successfully with very interesting results. We are now collating these findings in collaboration with soils micromorphologist Sarah Sherwood and geologist Richad K. Dunn. Alice Hom and the EISP staff keep us on track with all of these data and Alice is hard at work completing our cartographic projects. She has collaborated closely with Pat McCoy on entering his 1968 archaeological survey data into Datashare. We are on deadline with our upcoming publication and looking forward to launching it in 2018! 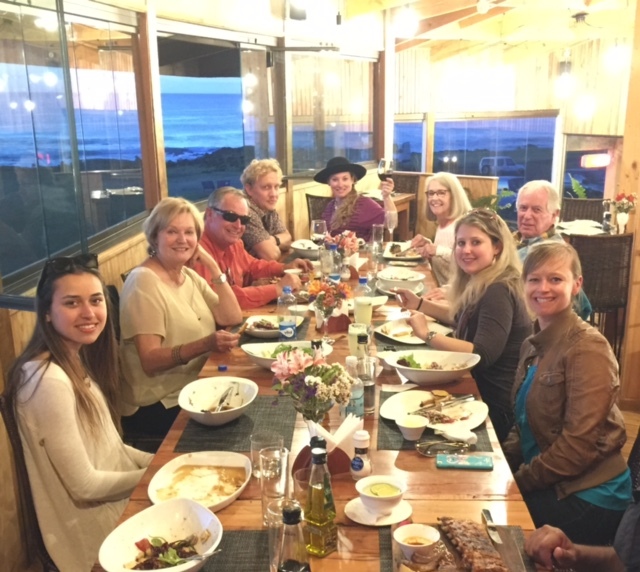 So, as you can see, we have not been sipping Margaritas on the beach at Anakena… oh, wait… actually, in March, 2016 we had the pleasure of sharing our project with Jimmy Buffet and his party! 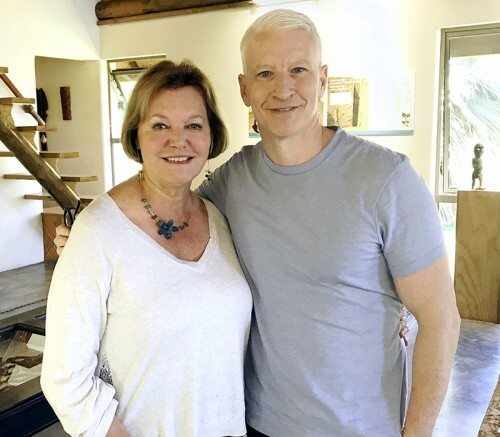 We are grateful to the Singing for Change Foundation, our UCLA supporters and, especially, to all of you. Cristián Arévalo Pakarati with Fuli Periera, curator at Auckland War Memorial Museum Tāmaki Paenga Hira. 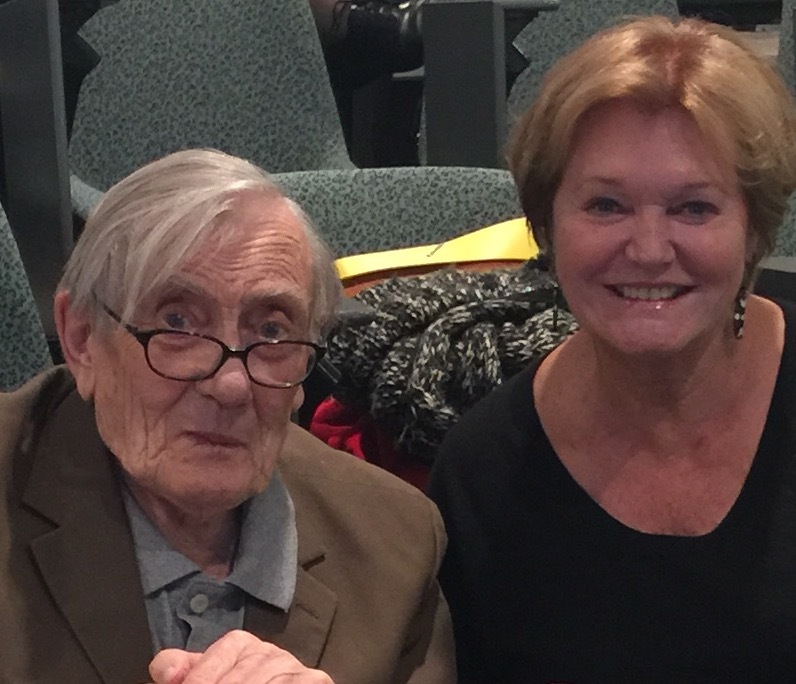 Jo Anne Van Tilburg with Jack Golson, Australia National University. Surf’s up! 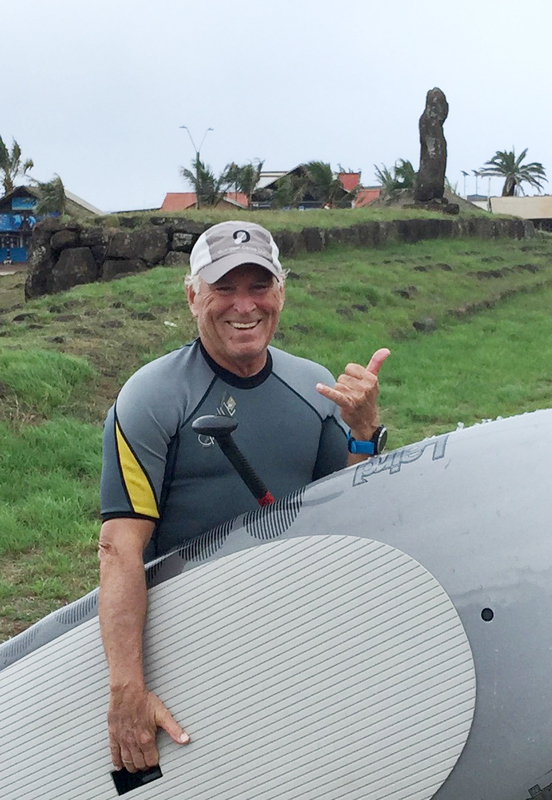 Jimmy Buffet with EISP on Rapa Nui. the moai (RR-001-156). 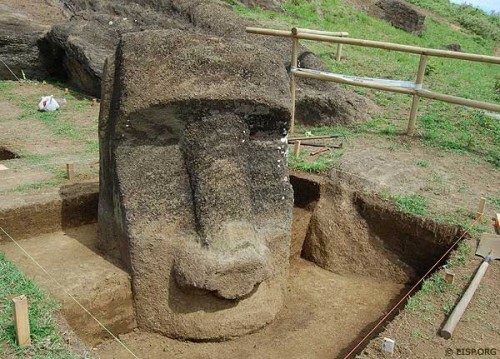 The moai, in turn, is unfinished and standing in a basin cut with great skill and care into the bedrock. There was no intention of moving this moai out of the quarry. The rounded form of the head and its incised, almond-shaped eye is more in keeping with petroglyph styles that with the elongated, rectilinear style of the moai. However, and as the new 3D imagery created by EISP team member Greg Downing of xRES Studio clearly shows, the head style is also very similar to that of Tukuturi (RR-002-030), the famous kneeling statue uncovered by the Norwegian Archaeological Expedition, 1954-55. This incredible new find means that we will now have to reconsider our ideas of moai style. Other finds during our 2014 seasons include a large shaped block of coral, an obsidian eye of a small carving, more pigments, basalt and obsidian tools, and a bone fishhook. To date, we have also recovered more than 6,000 stone tools (toki)! The analysis of this incredible amount of material is a huge undertaking, and we are hard at work with colleagues on laboratory studies of obsidian, basalt, wood, and carbon. We’ll keep you informed as we make, quite literally, new headway! We have had another wonderful, but really wet, field season during the month of August. The nearly constant rains were a big challenge. However, they also gave us more time than usual in our field lab, which was good. Our excavation goal was to expose the front of RR-001-156 to what we presumed was the level of a fire set nearby in 1920. We are certain of the date because of a photo we were asked to identify (slide, collection, Douglas Stewart Fine Books Pty. Ltd.). We also found the large fire scar in the soil. Which expedition set the fire? We came up with some possible culprits, but we’re not certain. 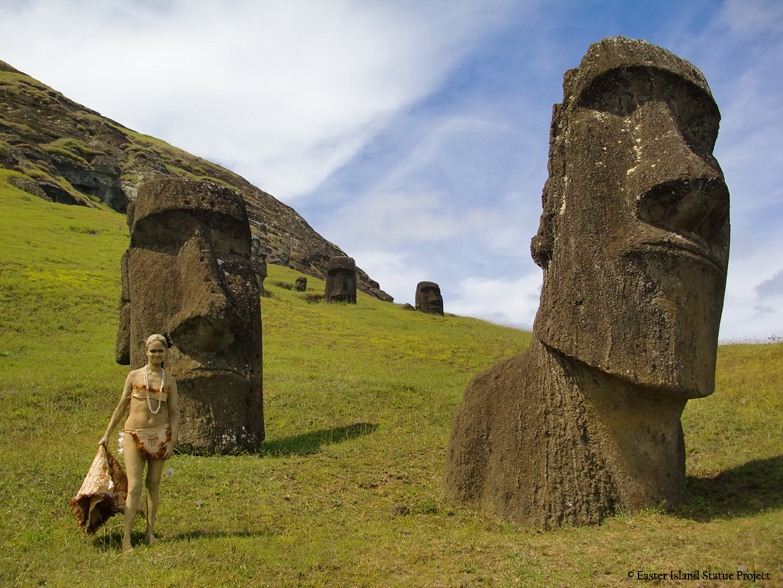 Their goal was apparently to take photos depicting the “mystery” of Easter Island. It might have been an American, Australian, or Chilean group. We need help sleuthing this out. Have a look at the mystery photo on the web site above, and if any of you have a clue about which expedition might have taken this photo and would like to share it, we’d be grateful! Drop us a note at mail@eisp.org. 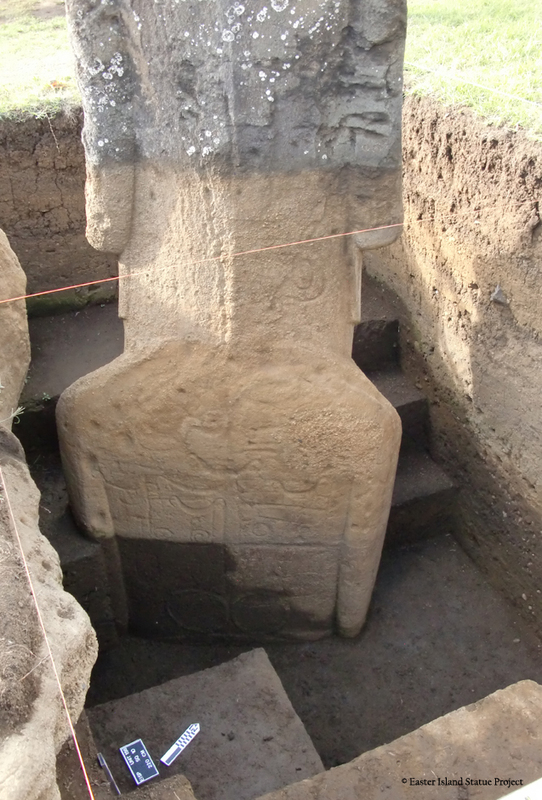 Our major excavation goal this season was to document the rock art (petroglyphs) on the statue’s torso. We accomplished our goal, but it was rough going. We found dozens of what by now are very familiar stone tools (toki). We have well over 1,000 toki now under study. 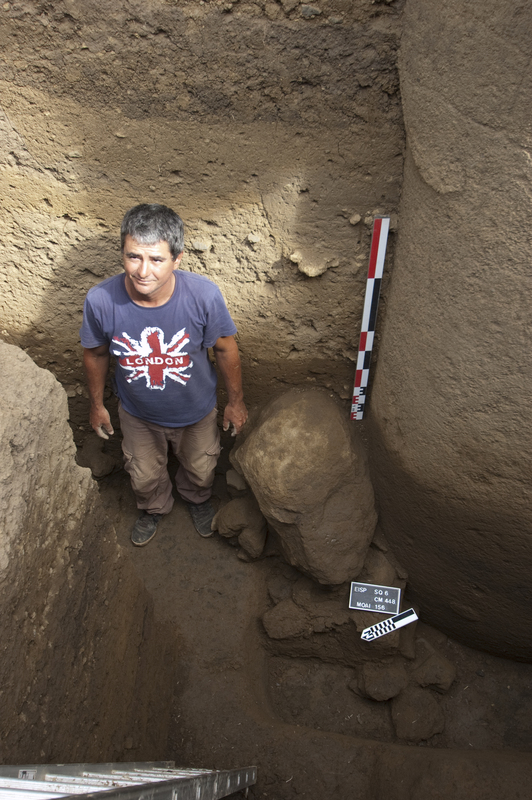 Screening the heavy, wet dirt that came out of the excavation demanded more than the usual amount of patience, and our Rapanui team members deserve a big mahruru for their efforts! We were also rewarded for our slogging by some really exciting finds! The field report we’ve just posted here for the season includes a photo of one of the most interesting objects: a fishhook made of bone. During our field season we were visited by a film crew from the Australian Broadcasting Corporation. The terrific program that resulted can be seen here. Our work will continue in November and then again in March, 2014. Thanks for your interest in EISP! I am writing you today from Rapa Nui, where we are embarking on the last phase of our excavations in Quarry 02 of the interior slope. For those of you who have been following us, we are now turning our attention to the front of the statue known as “Papa” (RR-001-156). 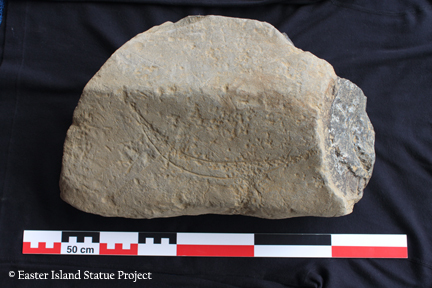 We have, to date, excavated both statues to their bases on their dorsal sides, and documented features dealing with the ceremonial uses of the statues (pigments), transport (base features, including a large post hole used for elevating the statues), and a small boulder with an incised petroglyph in a motif similar to those on the backs of the statues. We now know for sure that the “heads” on the slope here are, in fact, full but incomplete statues. Other work includes geological mapping (by Dr. Richard Dunn) of the interior and surveying of the lake bottom (Dr. Shelley Wachsmann and Jeffrey Morris). Stay with us, and we will fill you in upon my return! 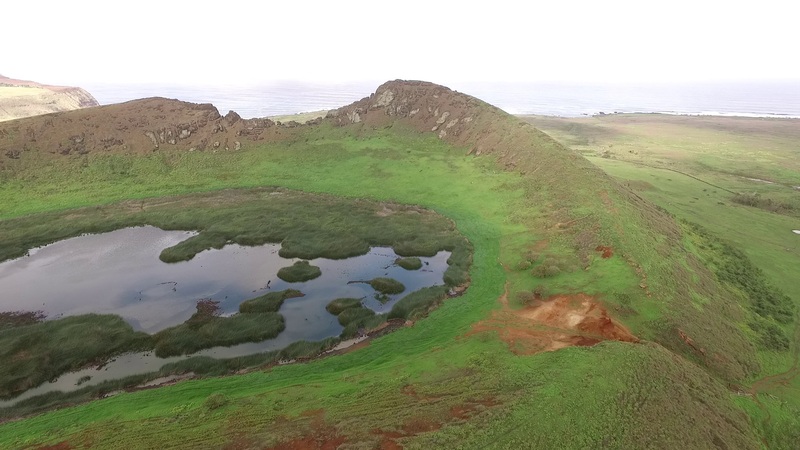 Rano Raraku quarry (Figure 1), within which 95% of the over 1,000 Easter Island stone statues was carved, is a massive crater of consolidated volcanic ash surrounding an interior, reed-filled lake (Figure 2). About half of the total number of statues recorded to date is still within the quarry zone. 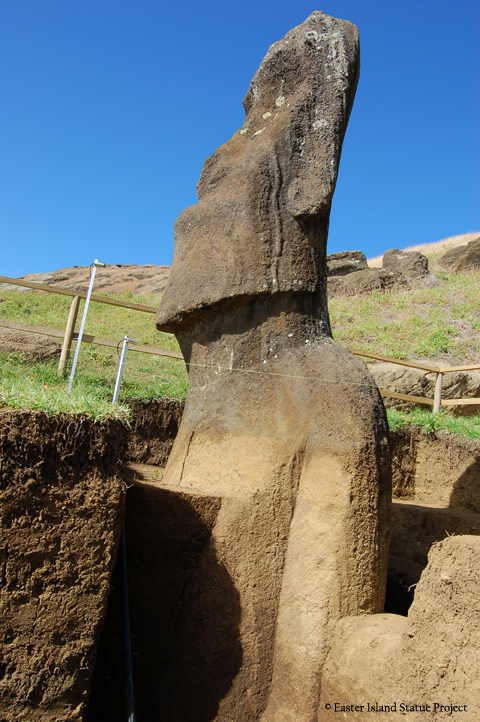 Some 150 statues stand upright on the interior and exterior slopes of Rano Raraku. They are buried to varying depths and appear often as heads only. While weathered and worn by centuries of exposure to the elements, many of them are still very beautiful (Figure 3). Rano Raraku was first reported to the outside world in 1868 by officers of HMS Topaze. 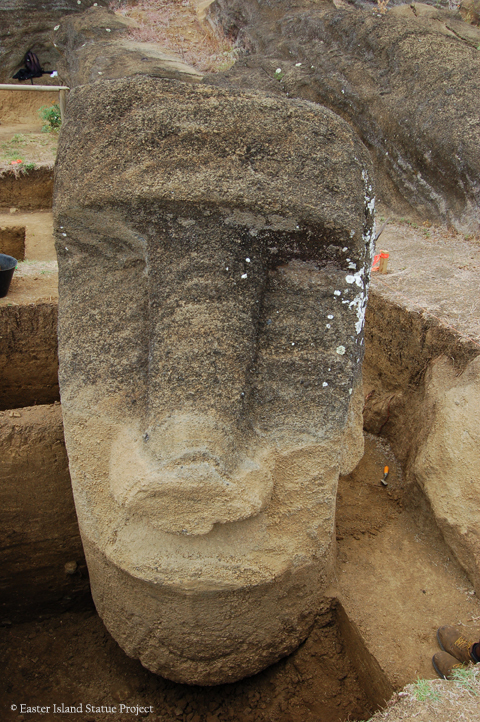 The world was fascinated, and many sketches, essays, newspaper articles, and books were published describing the statues embedded in the slopes as “heads.” Over 90 excavations in Rano Raraku since that time exposed the torsos of many statues. Katherine and William Scoresby Routledge of the Mana Expedition to Easter Island, 1914-15 published photos of their own digs illustrating the bodies of many statues. In 1954-55 Thor Heyerdahl and his Norwegian Archaeological Expedition to Easter Island excavated others, further documenting the existence of complete, but partially buried, statues. 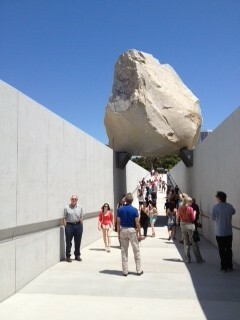 the statues were erected in place and stand on stone pavements. We also discovered that ceremonies were certainly associated with the statues. We found large quantities of red pigment, some of which may have been used to paint the statues. Finally, and perhaps most poignantly, we found in the pavement under one statue a single stone carved with a crescent symbol said to represent a canoe, or vaka (Figure 5). 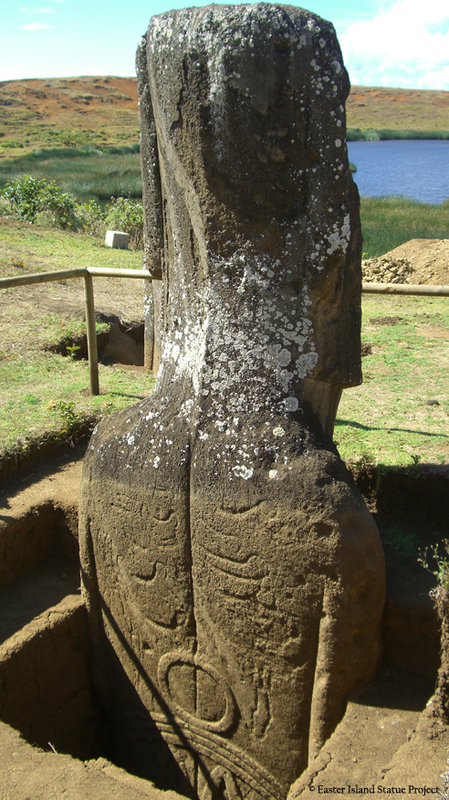 The backs of both statues are covered with petroglyphs, many of which are also vaka. A direct connection between the vaka symbol and the identity of the artist or group owning the statue is strongly suggested. Want to know more? Read our excavation reports for Seasons I, II, III, IV and V.
Statues RR-001-156 (left) and RR-001-157 (right); Photo courtesy of Micheline Pelletier. 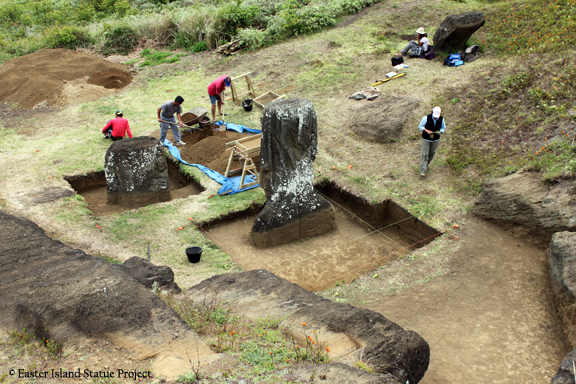 We have just returned from our third season of excavation in Rano Raraku Quarry! Our attention was directed throughout this field season on RR-001-156, the companion statue in Quarry 2 to previously excavated RR-001-157. 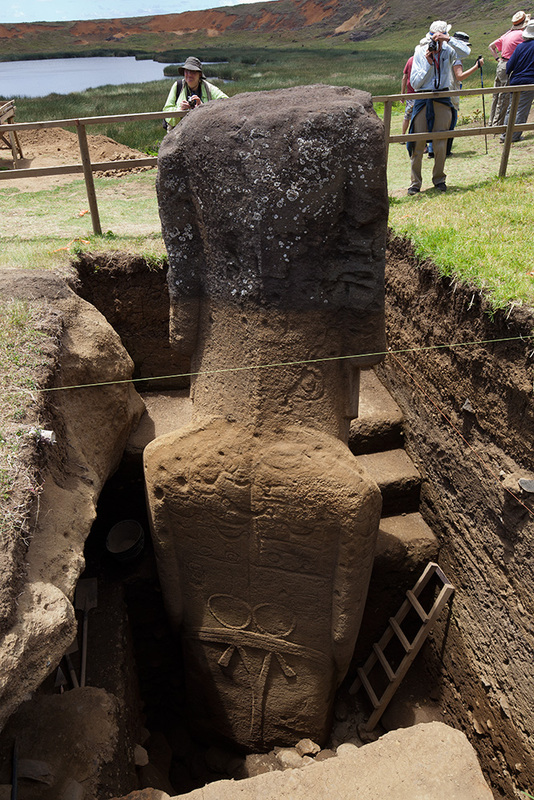 Both statues, as you know from our previous letters, were excavated by the Mana Expedition to Easter Island (and other groups), although none of these digs ever reached the bases of the statues and results were never published. This season was especially interesting in that we were joined by five remarkable young students of archaeology and conservation at the Universidad Internacional SEK in Santiago. Enthusiastic and skilled, with wide backgrounds in survey and excavation, the students are thrilled to participate in the first authorized excavations in Rano Raraku since Thor Heyerdahl and his Norwegian Archaeological Expedition of 1954-55. Each of the students experienced a varied range of activities, including fine-grained excavation and removal of fragile bone and carbon, archival-safe storage of materials, and log book and catalog entry. Informal lectures and other learning activities allowed us to share previous experiences and insight, and there were many opportunities to interact with tourists and other professional visitors. Several thesis project opportunities are embedded in our research, and one of the students has already embarked upon a follow-up study of the many dozens of stone tools we have collected. Dr. Christian Fischer, in cooperation with Monica Bahamondez P., reinstalled our environmental monitoring equipment in order to transmit conservation data to DATASHARE. Micheline Pelletier took valuable photos of our excavation using an unmanned aerial vehicle (UAV). We will return to our Season IV excavation of RR-001-156 in July. Read our preliminary report of Season III and Dr. Fischer’s conservation report. You are invited to follow our progress over the next few years on this web site. Although we are partially funded by a generous grant from the Archaeological Institute of America, we need your help. Please join Friends of EISP. 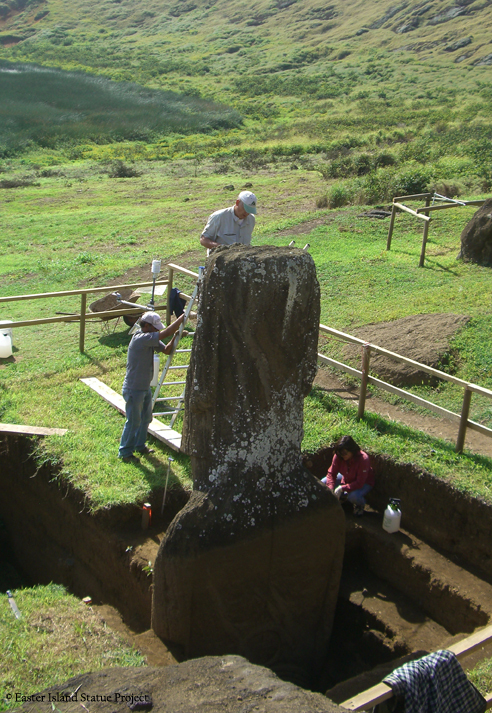 Click on support to become a member of our team as we work to conserve the stone giants of Rapa Nui. 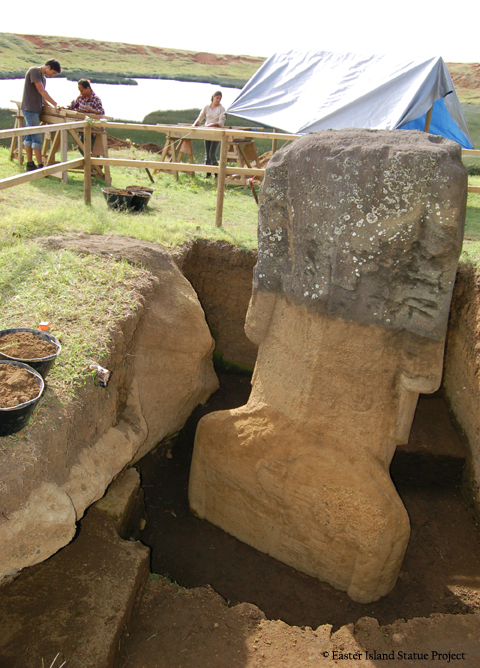 March-April 2010: EISP's excavation of a moai in Rano Raraku Quarry interior. 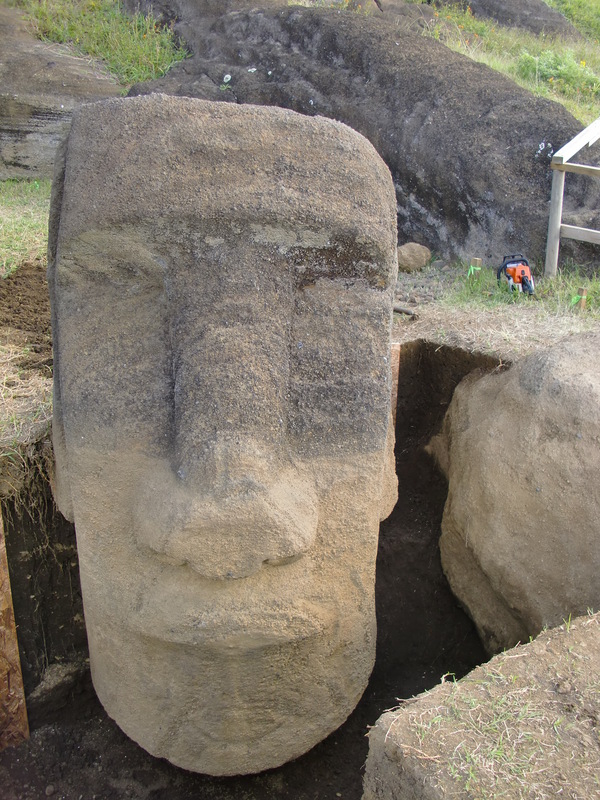 This moai was nicknamed "Papa" by Katherine Routledge in 1914. Quarry bedrock is visible in one of the excavation squares. The color variation on the statue's stone surface reflects previous soil levels. 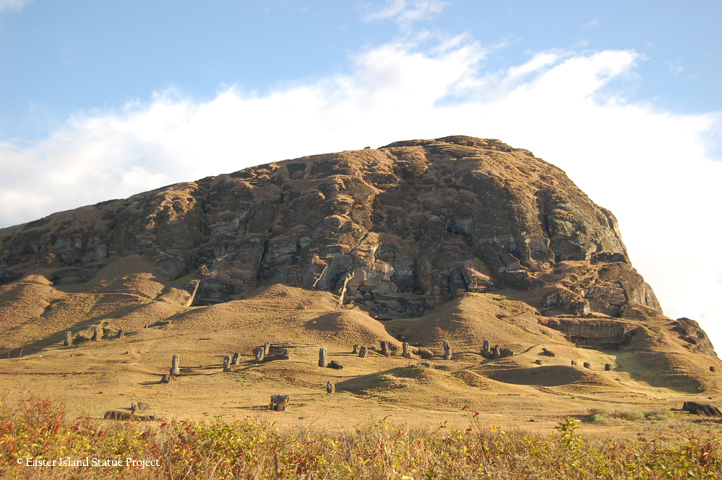 In March and April of 2010, our EISP team began the first authorized excavations in Rano Raraku Quarry interior since Thor Heyerdahl’s Norwegian Archaeological Expedition in 1954-55. Two statues said by Katherine Routledge of the Mana Expedition to Easter Island, 1914-15 to be called “Papa” and “Papa’s Wife” were selected due to their archaeological and iconographic importance and their ethnographic history. Like the famous statue Hoa Hakananai’a now in the British Museum, “Papa” and “Papa’s Wife” have complex and enigmatic carvings on their backs. 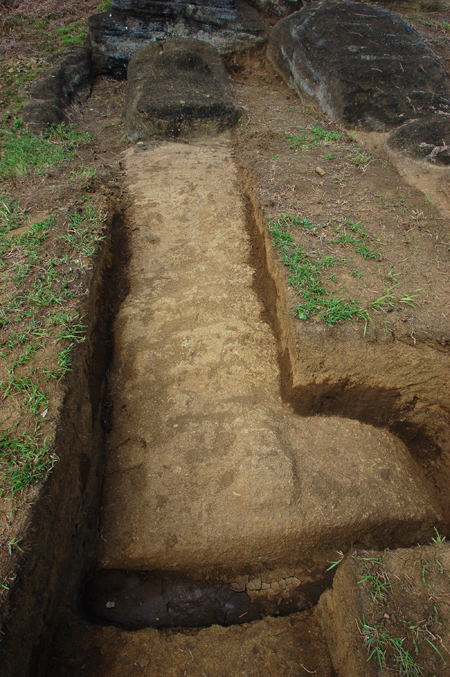 Our excavations will reveal these designs and promise new information vital to understanding ancient Rapa Nui religious belief and statue use. At the 50 cm level, Christian Fischer of UCLA and Monica Bahamondez P. of Chile’s Centro de Conservación y Restauración installed non-contact, microclimatic radiometric sensors near the statues to collect data on soil moisture and stone temperature. Protection treatments will follow detailed analysis of the environmental data. Partially funded by the Archaeological Institute of America Site Preservation Initiative and with support from the Mana Foundation, we need your help. 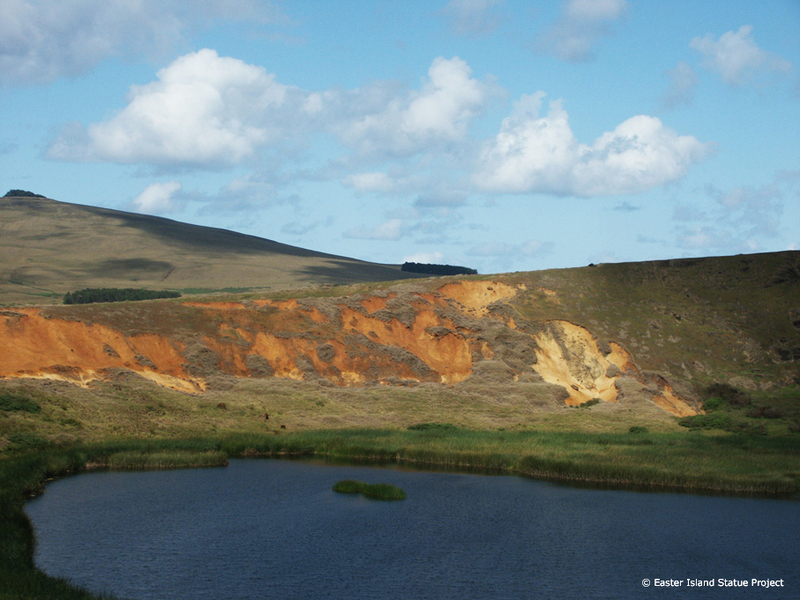 Please visit our Support link to find out how you can join us in this major new step towards understanding and protecting the unique environmental, aesthetic and historic value of Rano Raraku. DATASHARE is our newest venture. 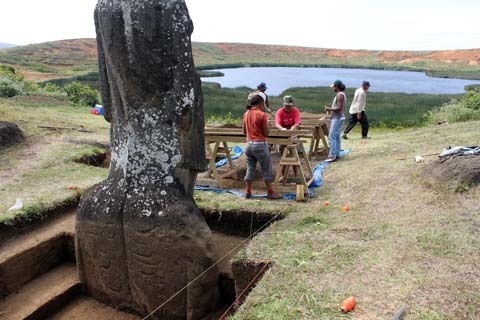 It will provide access to associated researchers, conservators and others working to preserve the fragile and irreplaceable patrimony of Rapa Nui. 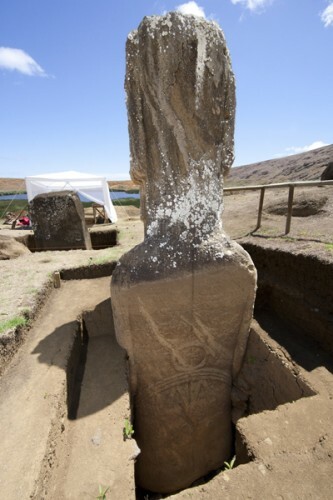 DATASHARE is part of Phase 1 of the Easter Island Statue Conservation Initiative, generously funded by a grant from the Site Preservation Task Force of the Archaeological Institute of America. According to Larry Coben, co-chair of the Task Force, EISP exemplifies “the model of preservation the AIA seeks to promote.” Phase 1 is opening the EISP database to CONAF Oficina Isla de Pascua and our collaborators, including Mónica Bahamondez P. of the Departamento Nacional de Conservación y Restauración (DNCR) and Christian Fischer of UCLA. Phase 2 will incorporate the Consejo Monumentos Nacionales Isla de Pascua and the Municipalidad Isla de Pascua. DATASHARE will provide a permanent, accessible home for EISP data, advance the preservation of Rapa Nui patrimony, and permit informed conservation managment. The coming year promises new and exciting adventures, and we are looking forward to the beginning in March of the first of three planned field seasons and the on-going preparation of our Rano Raraku Atlas. 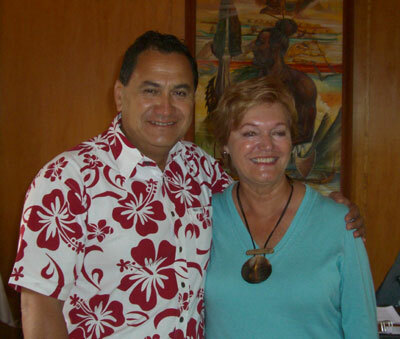 Mayor Petero Edmunds and Dr. Jo Anne Van Tilburg announcing the site preservation grant from the Archaeological Institute of America, Hanga Roa, Rapa Nui, 2008. 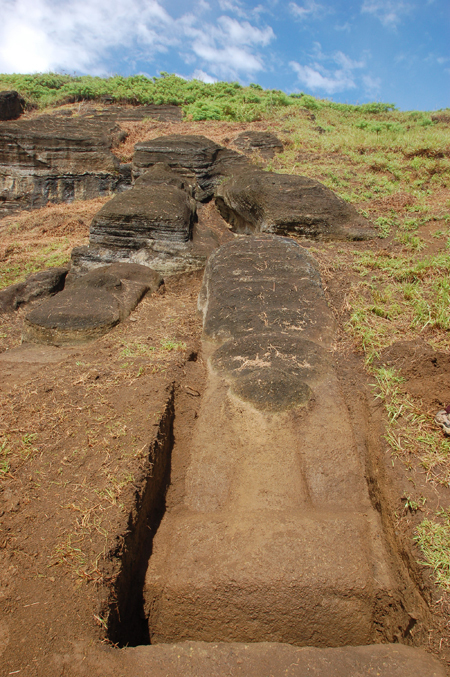 We are pleased that you have taken the time to join us, and to share in our archaeological exploration on Easter Island (Rapa Nui). 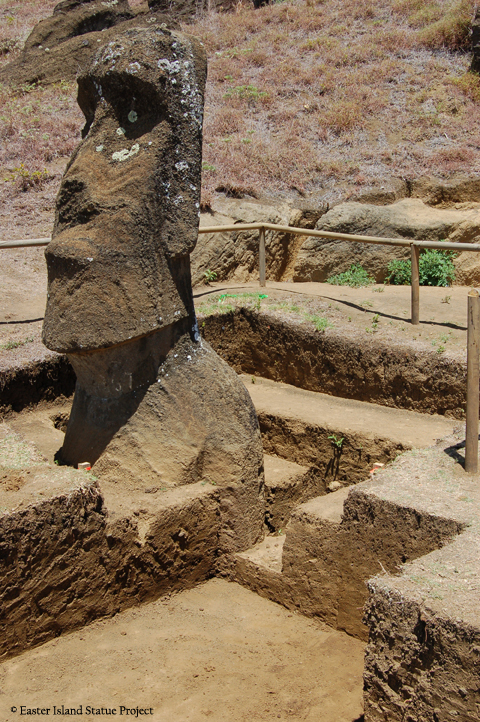 Our survey is a systematic mapping and descriptive study of all of the monolithic stone statues (moai) on the island and in museums and collections world-wide. We have created the world’s largest and most complete archive of maps, photographs, drawings, measurements and other data on over 1000 statues. We share our data with the supervising authorities in Chile and on Rapa Nui. Our research thoughts on the comparative analyses of our data are widely published. We participate in public programs and media presentations for the public. As you read this, our massive database is being transferred into a new, web-based data filing and sharing system that will allow access to all of our collaborators and colleagues world-wide, as well as to the Rapa Nui people and the interested public. We have established our own Mana Gallery on the island. It houses our field office and art gallery in which Rapa Nui artists show their work. They also use our data to innovate on the ancient aesthetics of their gifted ancestors. In this way, we enrich and expand our research. If you are fortunate enough to visit the island, please stop by the gallery. We are proud and grateful to announce the latest honor accorded our project. We have received a major field work and preservation grant from the Archaeological Institute of America. We hope you will join us often to follow our progress in the field.